Fbw7 dimers (light blue) bind target proteins (yellow) at multiple positions (red) to coordinate the binding of ubiquitin ligase (dark blue and orange). Tumor suppressor genes prevent cells from progressing to cancer through several mechanisms, including DNA repair, coupling the cell cycle to DNA damage control, and repression of cell cycle genes. The tumor suppressor Fbw7 represses key oncogenes including Myc and cyclin E by targeting them for ubiquitylation and proteasomal degradation. Fbw7 recognizes target proteins at a phosphorylated motif known as a degron. Some target proteins contain multiple degrons; however, the purpose of multiple degrons on these target proteins is unclear. In a recent report published in Genes & Development, graduate student Elizabeth A. Larimore, along with Drs. Markus Welcker and Bruce E. Clurman in the Human Biology Division and a team of collaborators, demonstrate that Fbw7 is a dimer in vivo and that multiple Fbw7 degrons on a target protein can cooperatively bind Fbw7 and buffer against mutations that may disrupt recognition of these target proteins. Cyclin E contains two degrons: a suboptimal, low affinity degron at the N-terminus and a C-terminal high affinity degron. To understand how multiple degrons influence Fbw7 interactions, Welcker, et al. generated a series of mutations, disrupting either of the cyclin E degrons or the ability of Fbw7 to dimerize. Using these mutated proteins, the authors found that Fbw7 monomers bind only to the optimal degron, while the suboptimal degron can increase binding of the Fbw7 dimer to cyclin E. Furthermore, changing the optimal degron to a suboptimal degron revealed that Fbw7 dimers, but not Fbw7 monomers, could cooperatively bind and degrade target proteins possessing two suboptimal degrons. To investigate the in vivo dimer function of Fbw7, the authors generated multiple independent cell lines that were homozygous for dimerization-deficient Fbw7. While these mutant Fbw7 proteins could be detected as monomers by non-denaturing gel electrophoresis, no monomers were detected in wildtype cells and dimerization was necessary for autoubiquitylation of Fbw7. Taken together, these data suggest that Fbw7 exists in vivo only as a dimer. The authors next turned their attention to the impact of dimerization on Fbw7 activity itself. They identified several Fbw7 mutations that disrupted the ability of monomeric forms to bind target proteins, but had little or no impact on the ability of Fbw7 dimers to bind their target proteins. This discovery suggests that dimerization diminishes the impact of mutations in Fbw7 that may reduce binding affinity to target proteins. Intriguingly, Fbw7 dimers ubiquitylated multiple sites in cyclin E (see figure), while monomers only ubiquitylated a single site. 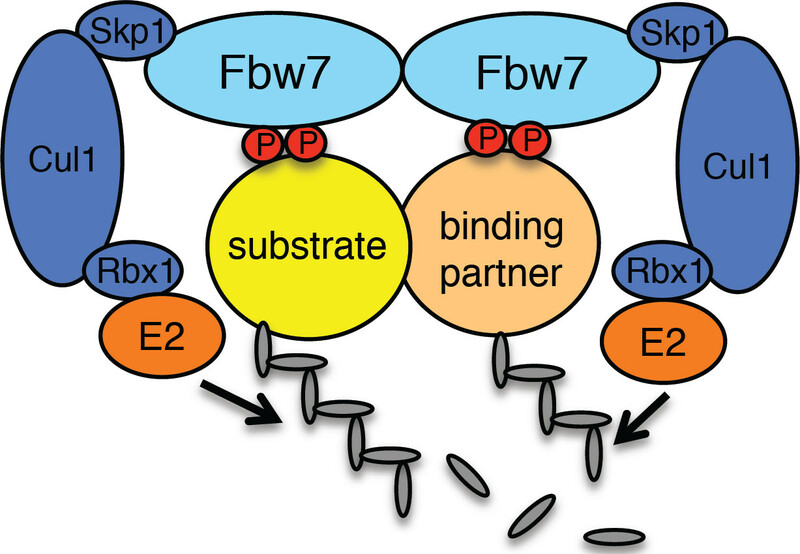 Therefore, Fbw7 dimers act not only to permit Fbw7 binding to less than optimal degrons, but dimerization also modifies the process of ubiquitylation, suggesting that multiple degrons in a target protein may allow for complex signaling pathways to regulate Fbw7-mediated degradation. This study provides new insight into the activity of Fbw7, demonstrating that Fbw7 dimers function more broadly than Fbw7 monomers. Fbw7 dimerization may have evolved to reduce the impact of mutations, either in target proteins or in Fbw7 itself, that would otherwise damage the ability of Fbw7 to degrade target proteins. "This work offers a rational for why Fbw7 forms dimers and can explain the most commonly found Fbw7 mutations in cancer," said Dr. Welcker. Welcker M, Larimore EA, Swanger J, Bongoechea-Alonso MT, Grim JE, Ericsson J, Zheng N, Clurman BE. 2013. Fbw7 dimerization determines the specificity and robustness of substrate degradation. Genes Dev. Epub ahead of print. doi: 10.1101/gad.229195.113.